With the acquisition of AVG last year, all Avast & AVG Business versions are utilizing the Avast Business A/V client with a new NEX-GEN Behavior Shield. Avast and AVG had independently been working on this shield for several years, and using the Avast’s Hardened Mode (whitelisting module), significantly increases protection against Crypto / Ransomware. These components are not available in the legacy Endpoint Protection versions. Also, Microsoft Windows 10 Spring Update (released) is not compatible with the legacy Endpoint clients. The user is prompted to uninstall Avast or the update will simply fail to install. Additionally, Endpoint has an End of Life for December 31st, 2018 where VPS updates will cease. I want to make sure that we get started on a migration, as this is included in your subscription at no charge, and the increase in protection is dramatic! I will assist you in creating groups and templates for testing using J.R’s best practices. You will be able to continue using Avast Endpoint Protection on those systems for your license term. Make sure that your Avast Endpoint Protection program version is on .1609 on the managed clients. NOTE: Each device will download the 300MB Avast installer file silently, so please be patient as this may take some time. Devices may request multiple reboots. This is usually due to restarts that are previously pending. Some devices may stay in “Pending” status for some days even though they are online. They are still protected, but unmanaged at that point. a. For the Cloud Management Console, go to https://id.avast.com/?target=https%3A%2F%2Fbusiness.avast.com%3A443%2F#register to register and receive your account activation email..
b. For On-Premise Management Console, go to https://www.avast.com/download-software and download the Console Installer for Windows. You can install on the same Windows device where your existing AEA / SOA resides. And follow the instructions. c. Next, search for the file export.xml on your existing AEA / SOA console. 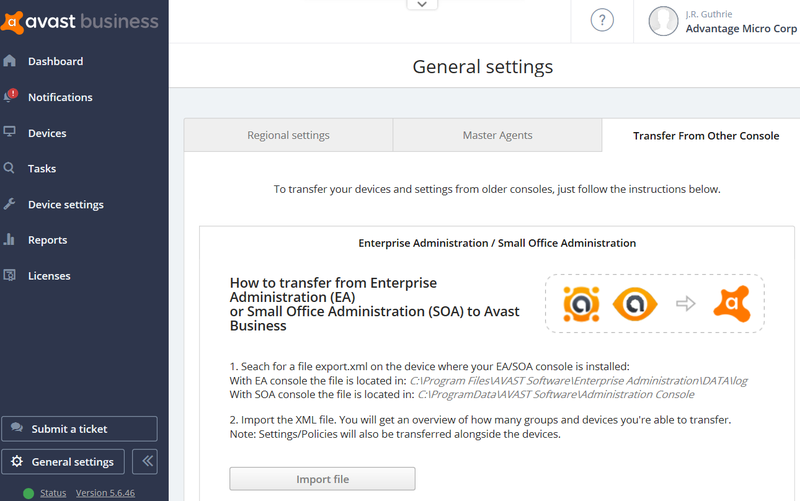 Now open your Avast Business Management Console (On-Premise or Cloud), go to: “General settings” (console, not template, lower left), then “Transfer From Other Console” and choose “Import file”. Import the XML file (from step d. / e. above) and you will now get an overview of how many groups and devices you’re able to transfer. The Settings/Policies will also be transferred alongside the devices. NOTE: The xml file has to be less than 1MB to work, which is approximately 1000 seats. Avast Business consoles will support multiple editions (we call them licenses) in the Licenses section. You may have to activate devices manually, if you have more than one license. Once devices are fully transferred they will have the status Safe, Vulnerable, or In Danger, depending on the health of the device. NOTE: If above fails, do the following. c. NOTE: If you are using the AEA or SOA consoles to manage your clients, you should first attempt to push out the uninstall using your Management Console. d. If you are using the AEA or SOA consoles to manage your installed devices, you should first attempt to push out the uninstall using your Management Console. i. In the SOA console you can do this using a job by going to JOBS > Scheduler > Create new job > Details > Job type, then set Deployment and Job selected: Uninstall Avast Protection. ii. In the AEA console you can do this using a job by going to Client-side tasks > Auxiliary tasks, then right click Auxiliary tasks and create a new task. Select to create an Uninstall managed product(s) task type, set the reboot settings, then select which computers to apply the task to and run the task. i. If you have Active Directory in your environment it is possible to download a Full MSI installer in addition to selecting which license tier and settings template to apply to newly installed devices so that they automatically activate after installation without requiring a reboot. ii. To do this you will need to configure a GPO that deploys the MSI installer in your environment. Please see Microsoft’s documentation regarding deploying MSI files for installation via GPO for the version of Active Directory you are using in order to set this up. vi. NOTE: When using the MSI installer via GPO, both the script and MSI files should be located in the same directory of a network drive share accessible to all computers and your GPO should reference these files by UNC file path. Please let me know what I can do to help, and have a great day!